Following Ukraine’s acceptance of ICC jurisdiction last week, ICC Prosecutor Fatou Bensouda decided today to open a preliminary examination into the situation. The examination will establish whether the conditions set forth by the Rome Statute for opening a full investigation have been met. On 17 April, Ukraine formally accepted ICC jurisdiction over crimes that allegedly took place during the “Maidan” protests in Kiev from 21 November 2013 to 22 February 2014. Article 12(3) of the Rome Statute allows non-member states like Ukraine to accept the Court’s jurisdiction. No Peace Without Justice this week joined the Coalition and others welcoming Ukraine’s acceptance of the Court’s jurisdiction. 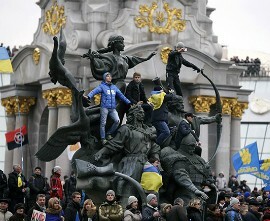 The International Renaissance Foundation in Ukraine called for Ukraine to ratify the Rome Statute. Russia and China reportedly blocked an effort to place sanctions on several individuals involved in the CAR conflict. The International Federation for Human Rights (FIDH) and the Kenya Human Rights Commission criticized Uhuru Kenyatta and William Ruto for infringing on rights and working to undermine the ICC during their first year in office. George Kegoro of the International Commission of Jurists-Kenya argued that Kenya’s judiciary must continue to assert its independence. Njonjo Mue of Kenyans for Peace with Truth and Justice said that the ICC decision to summon eight witnesses in the Ruto/Sang case “works towards the course of justice.” Ruto’s defense counsel indicated that they intend to appeal the decision. International law expert William Schabas called the ruling an example of judicial activism that is both “welcome and exciting.” Deutsche Welle reported that survivors of the 2007-08 post-election violence fear they will be denied justice if the ICC cases collapse. Kenyatta distanced himself from Walter Barasa’s suit seeking to end the ICC cases against him and Ruto. Human Rights Watch called for Sudan to release political detainees and investigate abuses allegedly committed by security forces. Darfur civil society called for the resumption of peace talks and criticized Sudanese officials for praising the Janjaweed militias. UNAMID will reinforce its numbers to protect the displaced in South Darfur. As many as 406 people were killed in Bentiu, South Sudan, as rebel forces reportedly targeted Darfuris. Sudan accused South Sudan’s government of using Darfur rebel groups to fight against South Sudanese rebels. An opposition official said that ICC suspect and Sudanese President Omar Al-Bashir agreed to form transitional government. The Congolese government released a list of a dozen members of the M23 rebel group that have been granted amnesty. Writing for Al Jazeera, lawyer Toby Cadman argued that Libya’s Saif Gaddafi trial is fundamentally flawed and should be stopped. The International Justice Monitor interviewed Gaddafi’s ICC defense counsel. In the run-up to next year’s presidential election, Côte d’Ivoire is still split on whether prosecutions or amnesties are better for reconciliation, Regards sur Gbagbo reports (in French). The UN reportedly accused a senior Ivorian army officer of illegally selling diamonds and possibly using the funds to buy arms. The International Center for Transitional Justice welcomed a Ugandan parliament vote in favor of creating a gender-sensitive reparations fund for victims of the Lord’s Resistance Army (LRA). African troops captured a junior LRA commander and freed 10 hostages in the CAR. The leader of Mali’s 2012 coup could face the death penalty after charges against him were revised to include the deaths of soldiers who opposed his takeover. The UN’s envoy in Mali called for more troops to be deployed to the country’s northern region. FIDH, COFADEH and CIPRODEH called on Honduran authorities to exercise their responsibility to investigate and prosecute gross human rights violations (in Spanish). Almost 200 schoolgirls remain missing in Nigeria after last week’s Boko Haram kidnapping, well over the previous official figure. Meanwhile, the insurgent group claimed responsibility for an Abuja bombing that killed 75. The Daily Trust reported that the Boko Haram may have sought assistance from another insurgent group in Niger. Justice in Conflict’s Mark Kersten argued that Russia might not mind if the ICC got involved inUkraine. Academic blogger Kevin Jon Heller questioned whether Ukraine’s acceptance of ICC jurisdiction violates its constitution. The Coalition called on Honduras to pass legislation enabling greater cooperation with the ICC (link in Spanish). Bangladesh promised to support universal ratification of the Rome Statute as its foreign minister Abul Hassan Mahmood Ali visited the ICC in The Hague. The ICC prosecutor is reportedly still considering a complaint and acceptance of jurisdiction under Article 12(3) lodged by Egypt’s Freedom & Justice Party following last year’s coup. The International Refugee Rights Initiative, Human Rights Watch and FIDH each paid tribute to Sudanese activist Osman Hummaida, who passed away on 17 April. Human Rights Watch welcomed Kosovo’s creation of a special court to try abuses allegedly committed during and after the 1998-99 Kosovo war. The American NGO Coalition for the ICC commemorated the Armenian genocide and examined the developments in international law that followed. The Organization for the Prohibition of Chemical Weapons is investigating allegations that chlorine gas was used in Syria earlier this month. The lead investigator of the UN inquiry in North Korea demanded that the Security Council refer the matter to the ICC.